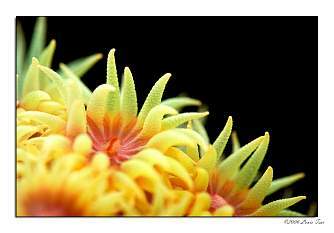 I've always been fascinated by nature and am a self-professed nature photographer. My journey into this hobby was kick started by two Siamese fighting fish that were used to teach undergraduate students at my university. 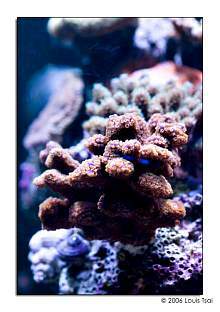 After a much lighter wallet and some time later, my interest turned to starting a miniature reef aquarium. This nanoreef hasn't always looked the way it does now. 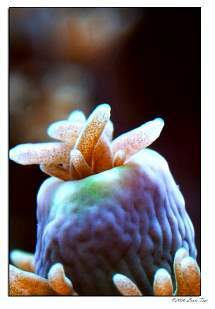 It used to have a lot of soft corals, macroalgae and even a seahorse (H. barbouri) at one stage. 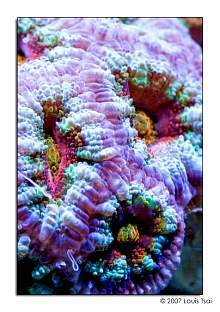 Over time, stocking became dominated by mostly stony corals. 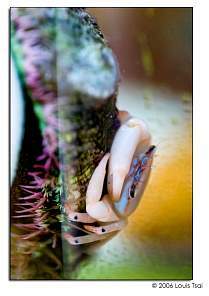 The main advantage of a small tank is the higher level of intimacy between the creatures within the tank and the aquarist. 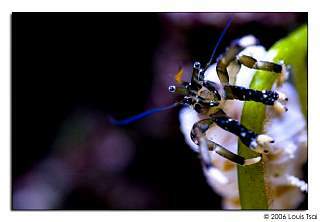 The smaller size allows for closer observation, and often easier macro photography. Since this tank's setup I still discover new creatures within the tank on a frequent basis, and this is exemplified by the number of unidentified hitchhikers I've photographed. The display tank is a no name all glass tank I purchased from a LFS. It measures 30cm L x 30cm W x 35cm H (8.32 gallons). It has curved front corners but nothing fancy beyond that. The back panel has two 20mm (3/4") bulkheads installed with an external Durso standpipe for the drain. 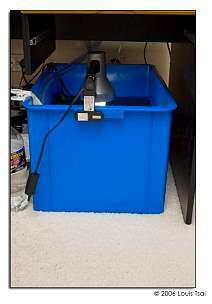 The refugium is a plastic tub that measures 80cm L x 44cm x 30cm H (27.9 gallons). 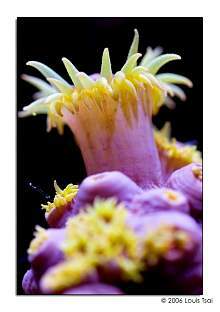 Within the refugium are 30kg of sand, a variety of macroalgae, live rock and a few mangrove trees. The mangrove trees serve a chiefly aesthetic purpose. 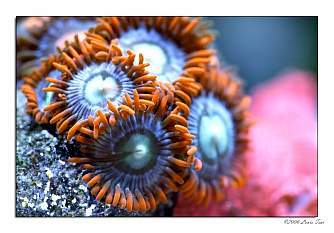 A powerhead within the refugium provides circulation. Most of the circulation within the tank is provided by a Tunze Nanostream 6025, which is rated at 2500 L/h. This is combined with the return pump, an AquaMedic Oceanrunner 2000. 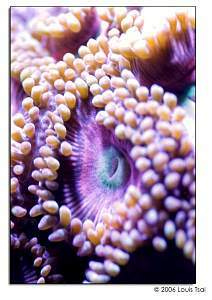 The Tunze 6025's diffused current helps to minimize sand storms, giving the mandarin goby an easier time. Together, the Oceanrunner 2000 and Tunze 6025 circulate the display tank's volume approximately 130 times per hour. 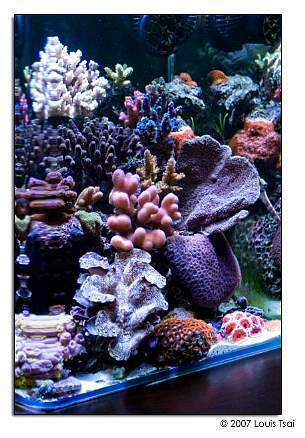 This may seem excessive and even undesirable; however, consider that in a nano tank, a lot of the flow is deflected off the aquarium's walls. My filtration scheme is very simple. The tank drains into a media filter bag containing active carbon and filter floss. 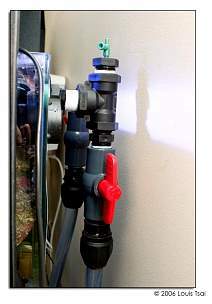 No skimmer is used because target feeding and large water changes keep nutrients at a low level. Left: Durso standpipe; center: cooling fan; right: the sump. The tank is lit by a single AquaMedic Oceanlight housing a Coralight 150-watt 20K double-ended bulb driven by an Osram electronic ballast. There is no other supplemental lighting. 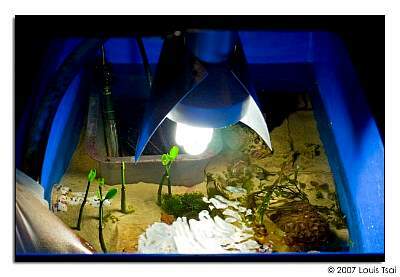 During the night the tank is lit by a cold cathode neon light that simulates moonlight. 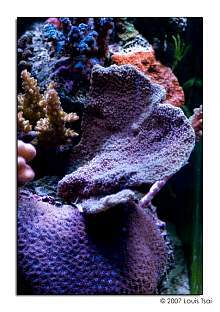 Moonlights are great as they provide yet another viewing opportunity for your tank. I've spent countless hours looking at strange critters go about their busy night life under the moonlight. 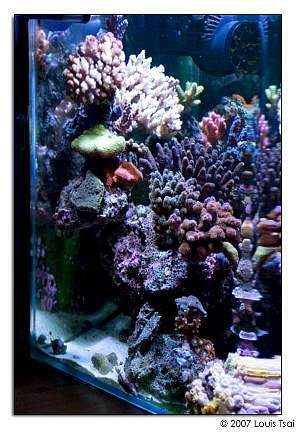 The tank is heated by a 100-watt glass heater, which is unplugged during summer when it is never needed. 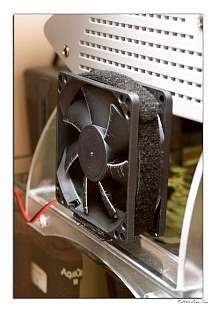 Cooling is handled by a simple 8 cm computer fan that I wired myself. It does a good job of cooling the tank, but it isn't enough to combat the Australian summer. A standing floor fan is also used to cool the tank during the hottest days. On the hottest days the photoperiod is changed to take advantage of the cool early mornings. 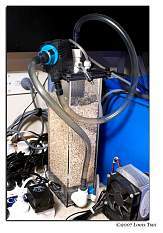 The tank is fed by a small calcium reactor that is set to a slow drip for five hours per day. This maintains the calcium and alkalinity levels at the desired concentrations without human intervention. Supplements are only used for minor adjustments to specific chemical parameters. Before the days of the calcium reactor, the only supplements used were for calcium and alkalinity maintenance. 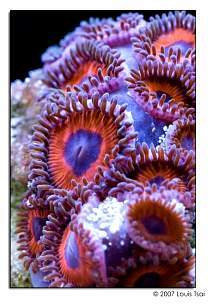 For calcium I use Seachem's Reef Complete, which also maintains magnesium; 6 ml is added in three separate batches every day. 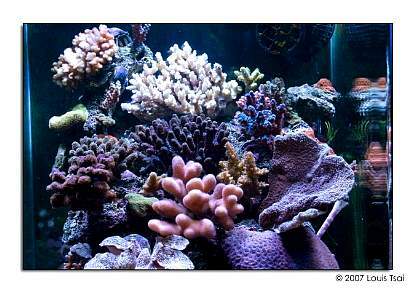 Alkalinity is maintained using Seachem's Reef Buffer; 2.5g is dissolved into two-liters of top-off water and dripped slowly over the course of the day. At one stage kalkwasser was used to maintain these parameters. This was made using dechlorinated tap water, excess Builder's Lime and white vinegar. I eventually stopped using this method because my tap water isn't soft enough to dissolve the lime to the required saturation within a satisfactory amount of time. In addition, the water changes couldn't keep up with the magnesium demand and much of the supplemented calcium ended up precipitating out of solution. My daily maintenance regime involves scraping the glass clean and dosing the previously mentioned supplements. 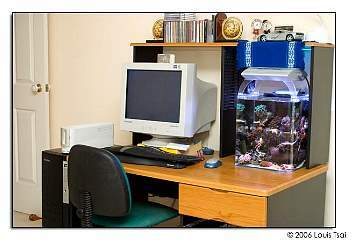 Weekly maintenance involves a 10-liter water change (approx. 18% of total volume) with natural sea water. I formerly used Instant Ocean salt mix, but that was too expensive and time consuming because freshly mixed artificial saltwater required extra supplements to adjust its parameters. Natural saltwater is much cheaper and simpler. The filter floss and media bag are washed out thoroughly every week. 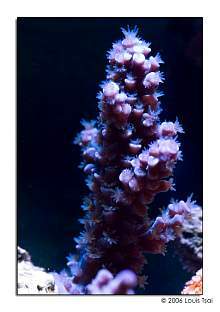 I also prune the macroalgae in the refugium and siphon any detritus out of the tank. During water changes the standard battery of tests is carried out, including nitrate, phosphate, calcium, alkalinity and pH. These are recorded on a spreadsheet, which also records the time of the tests and what maintenance regimes were performed, i.e., water changes, supplement additions, etc. Salifert test kits are used for water parameter tests and a refractometer is used to measure salinity. 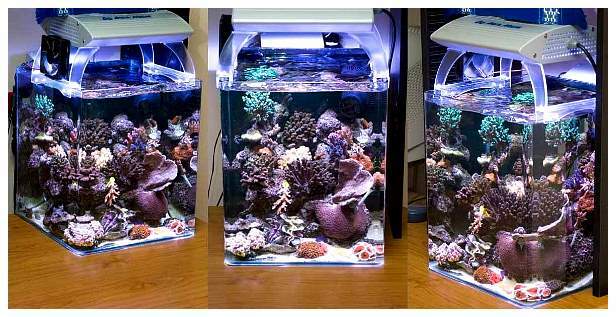 The tank is fed half a cube of Hikari Spirulina Brine or Mysis per day. 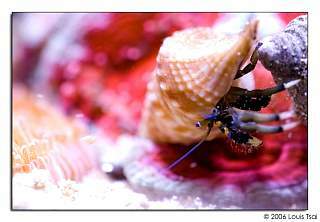 The fish, crabs and shrimps are fed daily, while corals are fed every other day. 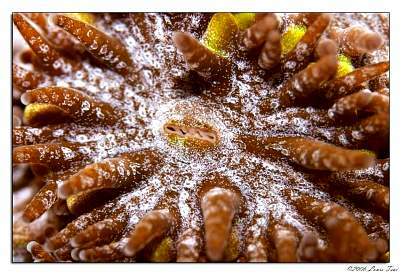 The coral feeding regime is designed to minimize nitrate concentration; however, any coral that is capable of swallowing is fed on those days, in particular the Tubastraea and Acanthastrea colonies. Frozen food is thawed and then target fed using a baster. This helps to minimize uneaten food. It is always challenging to find livestock that is both interesting and appropriate for a tank this size. 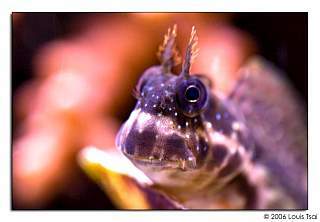 People often look at me suspiciously when they see a mandarin goby swimming around in the tank. Fortunately for me, I managed to find this spotted mandarin (Synchiropus picturatus), who is more than willing to consume appropriately-sized frozen food, including Mysis and Spirulina-enriched brine shrimp. 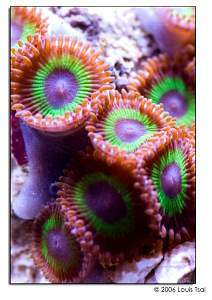 She was purchased as a juvenile and was introduced as the first livestock into this tank. She is fed once each day and has maintained her body weight. 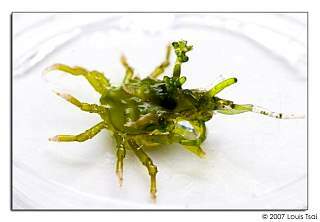 The copepods and amphipods returning from the refugium also keep her entertained and well-fed. 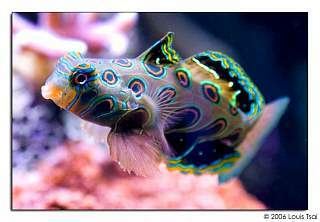 At this point I feel that I should point out a few technicalities regarding the husbandry of dragonets in a small tank such as mine. 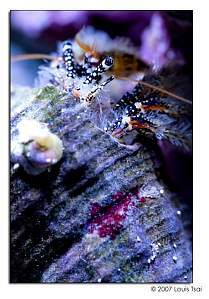 I definitely do not condone keeping dragonets in an environment where they will deplete their natural food source within a short time. 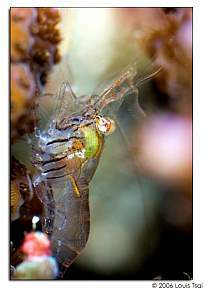 However, this rule can be relaxed in cases where the fish accept frozen food of the correct nutritional profile, such as Mysis. In addition to frozen food, they need a lack of competition for food because they are too slow to compete with even moderately fast feeders. Unless these conditions can be provided, their long-term survival remains questionable. 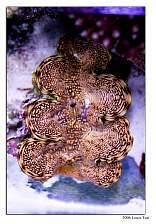 In addition to the spotted mandarin, the tank also contains a lawn mower blenny that will be relocated soon because he has a bad habit of nipping my giant clam. 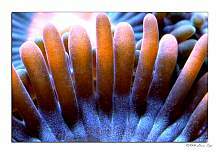 Several invertebrates inhabit this tank. 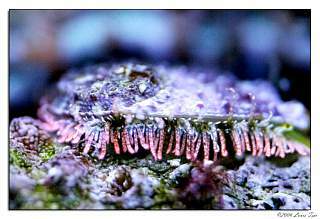 Besides the standard clean-up crew consisting of snails and small hermits, there are abalone, crabs, shrimps and other unidentified sea creatures. Most of these came as hitchhikers with live rock. Maintaining a small tank hasn't been one of the easier things in my life. However, the delicate balance within these glass walls demonstrates the equally fragile balance in our ecosystems. 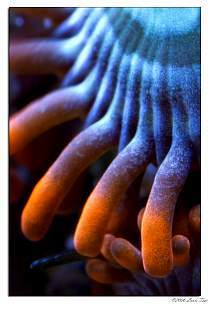 Of all things, big and small, that I have learned in reefkeeping, the need to take care of our environment has been one that I appreciate the most and one that I hope all reefkeepers will also take to heart. 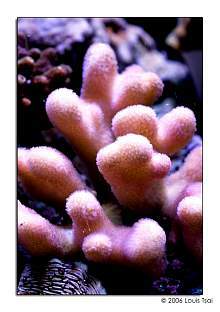 For me, reefkeeping has certainly been an addictive and rewarding experience. 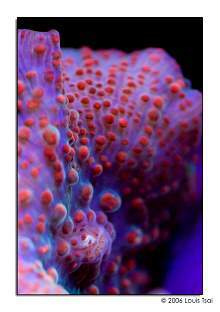 I would like to thank the global online reefing community for their support and inspiration, in particular, the good folks of Reef Central, the Marine Aquarium Society of Sydney, the Tropical Fish Centre and Absolute Reef Online.